A good smoke ring is a pit master’s point of pride. A beautiful deep rustic red outer layer of the meat that is so tantalizing it’s considered a badge of honor.Here, red meat does not mean rare or under cooked it means roasted low and slow and smoked to perfection. So how you really get a good smoke ring? Here are a few quick tricks to perfect your smoke ring – win friends, influence people and delight cookout guests. A good smoke ring is actually formed as a chemical reaction with nitrogen and chemicals in wood smoke reacting to the surface of the meat. I’m not convinced the actual creation of a ring tastes any different… But it’s coveted and looks great. First, the “ring” likes lower temps. Start extra low and slow. When your meat tops 145 degrees bark forms and smoke ring formation ( that chemical reaction ) ends. If you want a darker ring you’ll need to ramp up slowly. After that you could even throw it in the oven. Second. the “ring” likes it wet. Keep it moist with water pan and baste or sop with a mop sauce for first half of cook (or again until about 145f). Trim fat. The smokering will not form or penetrate fat if it’s too thick (surprise on the brisket pictured here it did). Use wood fire. More than just smoke, actual fire really develops the chemical reaction with the smoke & meat. The cooker used in the video is spectacular for forming a great smoke ring. Traeger pellet cookers use small compressed wood pellets. It’s real wood in the little fire pot underneath the cooker. It allows you to cook at a consistent low temperature and then ramp up and really give a strong fire source. It is real wood. 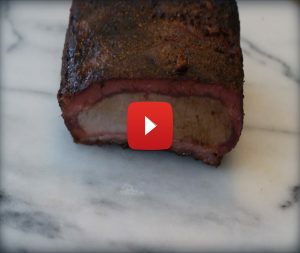 I’m using the hickory pellets in the video example here and the flavor you get from the smoke is deep and spectacular. I really think that’s why so many of the competitive barbecue pit masters use Traegers. It makes it easy, and in a lot of the competition rules you have to cook with wood and the Traeger passes that test. It features the assistance of an electric fan controlling your temperature so you take your eyes off the cook and relax a bit. I said earlier you don’t necessarily taste the smoke ring but if you really want to there are ways to kind of cheat the ring without a lot of smoke. Try Morton’s Tenderquick. 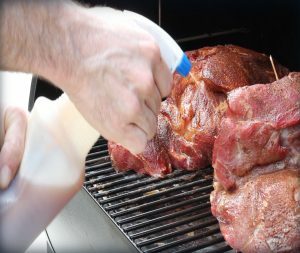 It’s a curing salt with nitrites and nitrates that you can use before cooking (warning: in a rub – a little goes a long way. You can also dust on for an hour and rinse off before cooking). The “whole food” foodies probably wont like it but it forces the chemical reaction on the surface of the meat. It’s one secret ingredient for getting a smoke ring. There’s also a thing called Fab and/or Pink Salt that is also out there. You can even take a more natural route by using celery. Celery salt, celery juice, and celery seed in your rubs will add more naturally occurring nitrates. Man I hate to be “that guy”, but this article is nearly unreadable. It looks like it was typed by an 11 yr old with an iPhone. PLEASE get someone to go through this and revise the pile of sentence fragments, run-ons, mis-spellings, and even mis-typings (Traeger is spelled several different ways here. including “trigger”, none of which seem to be correct). This appears to be a ramble that was posted without editing or even a single proof-read. Thanks – original post was actually an unedited transcription of the smoke ring video. But have tweaked. Appreciate the heads up.